Adding to the overall complexity of old-age financial planning is healthcare, which seems to grow in cost each year and too often is not properly accounted for in Americans’ retirement plans. Indeed, many pre-retirees assume that Medicare will be able to cover all of their potential healthcare bills in old age, but this government program was never designed to cover medical expenses in full. 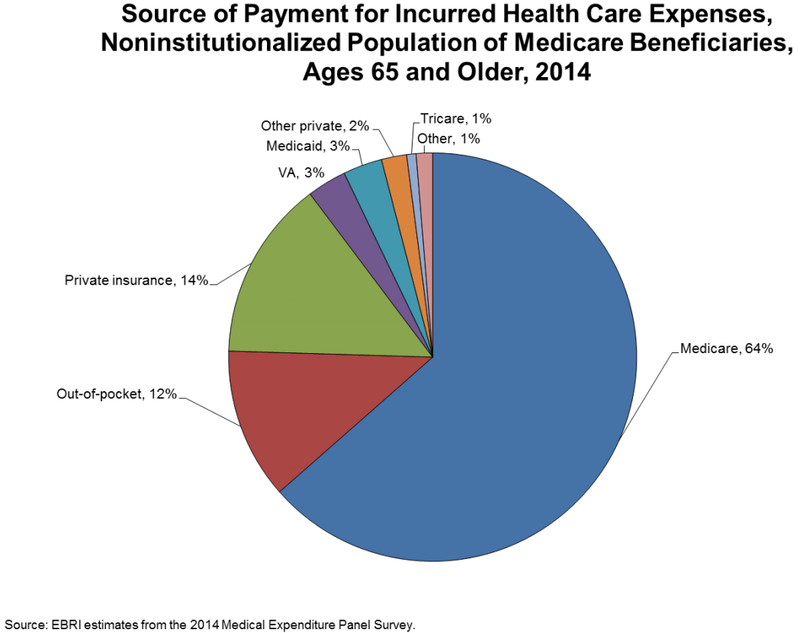 In fact, Medicare covered just 64 percent of the cost of healthcare services for Medicare beneficiaries ages 65 and older in 2014, according to the most recent data from the U.S. Department of Health and Human Services, while the rest was typically paid for by private insurance coverage and out-of-pocket spending. Healthcare expenses during retirement can be significant, and an updated study by the Employee Benefits Research Institute (EBRI) estimated that a 65-year-old man (woman) would need $73,000 ($95,000) in savings just to achieve a 50 percent (coin flip) chance of having enough money to cover all healthcare expenses in retirement, e.g. 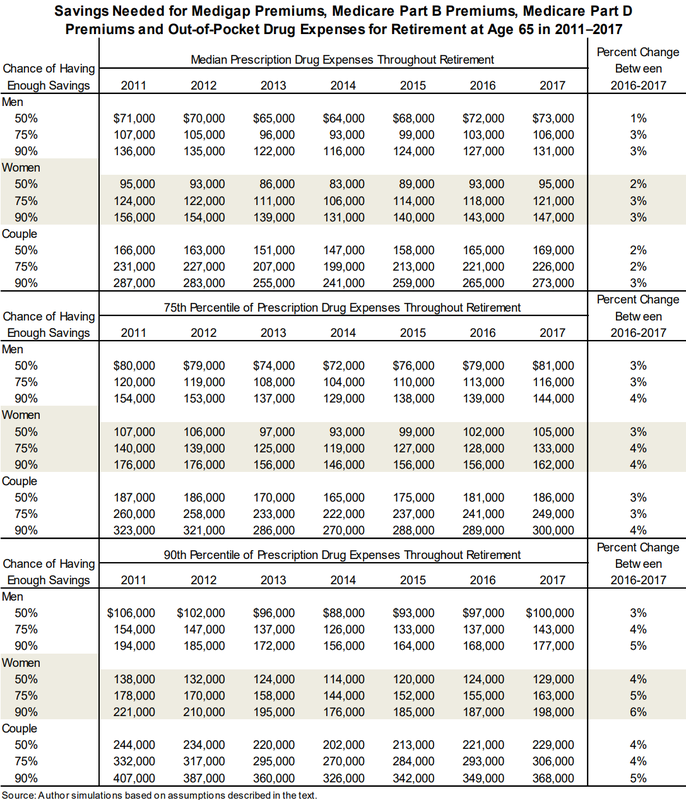 premiums and median prescription drug costs. For a 90 percent confidence level, those figures jump to $131,000 for a man and $147,000 for a woman. With Medicare Parts A and B, retirees can find help through the purchase of Medigap insurance that allows them to avoid deductibles and other cost-sharing. It is not possible, though, to completely avoid the deductible and other cost-sharing associated with Part D outpatient prescription drugs. 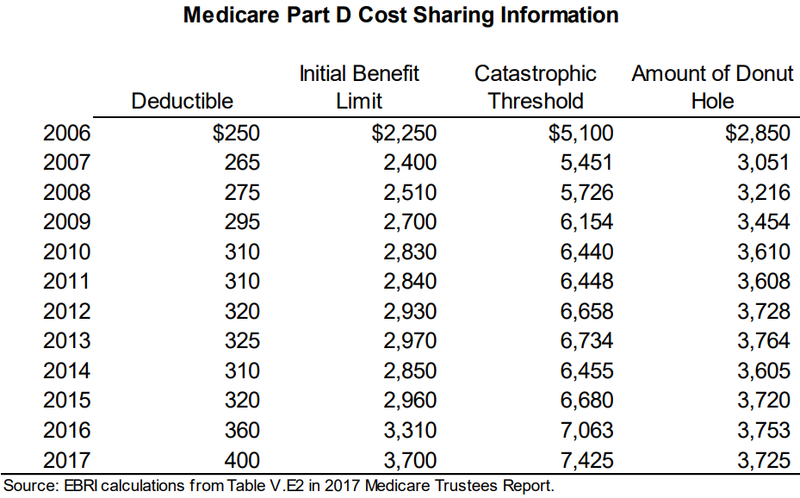 Specifically, beneficiaries under Part D are responsible for a 25 percent coinsurance on expenses between the deductible and the initial benefit limit. Once the initial benefit limit is reached, beneficiaries are essentially responsible for everything until they reach the catastrophic limit, above which they pay a 5 percent coinsurance. Those additional prescription outlays can be quite large, and the EBRI researchers calculated that a married couple with relatively high drug expenses throughout retirement would need as much as $368,000 in savings to be somewhat certain that they will be able to cover all of their healthcare costs in old age. What is worse is that the EBRI’s estimates do not even include any expenses associated with long-term care, a growing financial risk that 44 percent of Americans recently surveyed by Transamerica said is one of their greatest retirement fears at the moment. Only a reduction in their Social Security benefits and outliving their savings were more frequently cited by respondents as a top retirement concern. Such statistics only increase the importance of utilizing every tax-advantaged savings vehicle available, e.g. 401(k)s, IRAs, and HSAs, and regularly working with a professional financial advisor to make sure that you remain on track to achieve the comfortable and secure retirement you deserve.